Keith Kocher's close-up magic is both fun and mystifying. His years of restaurant work have provided him with an ease that keeps his audience relaxed and entertained. Since he always works with the spectators, each table or show is a little different and individual. His stage show is a nice blend of some humor and magic. This is not your old fashioned magic show which pulls a rabbit out of a hat, but rather a nice assortment of effects done with common, everyday items such as cards, silks and ropes that will leave the audience wondering, "Now how did he do that?" Keith has been performing professionally for over 20 years. He has been featured on several television program specials, worked with film giants 20th Century Fox and Dreamworks Productions and has performed regularly for 2 national restaurant chains for the past 10 years. He is an award winning magician and is the past President of the International Brotherhood of Magician's Ring 54. His past client list includes many major corporations and he is often listed as a 5 star entertainer by booking agencies. 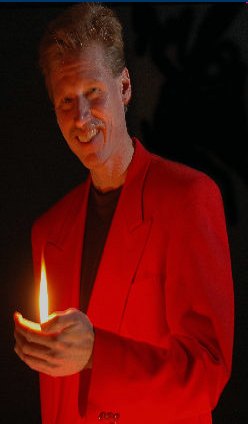 Keith Kocher has the ability to perform a variety of magic from table or strolling magic to an evening stage show and even a magic teach-in or lecture. He is a versitile performer who can help design a show to suit your specific entertainment needs for your special event. "The show was extremely entertaining. Everyone told me that they really enjoyed the show and were impressed by your skills both as a magician and a showman. Great job and thanks for making our party a memorable one. "-Brian Blackmer, Warren, Cameron, Faust & Asciuto P.C.